A memoir can have an extraordinary subject, whether it is a life, an event or an experience, yet, sadly, often the memoirist may not possess the skill to properly convey and express the uniqueness and power of that story. This is not the case with A THOUSAND VOICES. 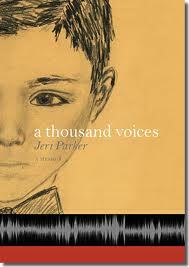 Jeri Parker has been blessed with an incredibly strong, exceedingly clean and lyrical talent for language. And language is at the core of her tale about the decades-long relationship she formed and nurtured with a boy who was poor, Mexican-American, and deaf. This memoir is about love, language, and how we communicate with those we love in order to reach and nurture one another’s spirit. In 1964 Jeri (then 24) is the Head of the Language Arts Department at Weber High School in Ogden, Utah. She teaches English and French. Her fascination with language leads her to a friendship with Marian Bentley, a teacher at the Utah School for the Deaf, also in Ogden. Marian has one student who is both beguiling and maddening. He is ten-year-old Carlos Louis Salazar. Carlos flourishes under Jerri’s care and teaching. Yet within a few years, at age 12, he is acting out in school. Jeri decides that she will spend a sabbatical in Montreal in the winter of 1967. After receiving an alarming letter from Carlos’s principal about the boy’s bad behavior outside the school, Jeri is concerned. Carlos is one of several children in a poor, single-parent family. Many of the young men end up in prison; many of the young women end up becoming mothers before they barely leave childhood. So Jeri asks Lilly if she may bring Carlos to Montreal, and his mother readily agrees. “In the months that Carlos stayed in Montreal, he changed his life” (meaning for the better). Carlos thrives in the new school and environment. His speech becomes understandable to nearly everyone. Alas, eventually this highly intelligent, sensitive, and artistic boy’s dark side eventually resurfaces. This doesn’t surprise Jeri. “If his happiness made me glow, his wrath dimmed the sun.” No one is more disappointed in his bad behavior than Carlos, and he exiles himself from Jeri and Montreal and returns to Ogden. Jeri had planned to go to Germany, but returns to Ogden, to her boy, and he moves in with her for two years. Life for Carlos takes worse and worse turns, even as Jeri, who moves to Salt Lake City and pursues graduate degrees and eventually becomes the Director of Women’s Programs at Westminster College, a liberal arts institution. Tragedy occurs, and Jeri rushes to Carlos’s side. This beautiful memoir, often heartbreaking but unceasingly inspiring, is a teaching plan for how to love. Looks wonderful. Love the quote at the end. You write beautifully too, Maura. Jeri, What more could a reader/reviewer want to hear? Thank you.